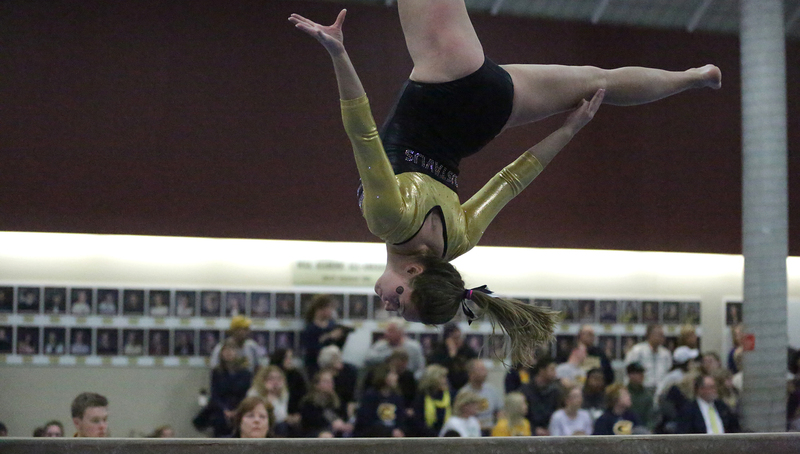 ST. PETER, Minn. – The Gustavus gymnastics team competed in its final home dual meet of the season at Sponberg Gymnastics Studio on Friday night, coming away with a 183.875-181.950 loss to UW-Eau Claire. The loss drops the Gusties to 2-5 in WIAC duals, while the Blugolds improve to 3-0. Gustavus posted team scores of 46.225 on vault, 45.900 on floor, 45.375 on bars, and 44.450 on beam. 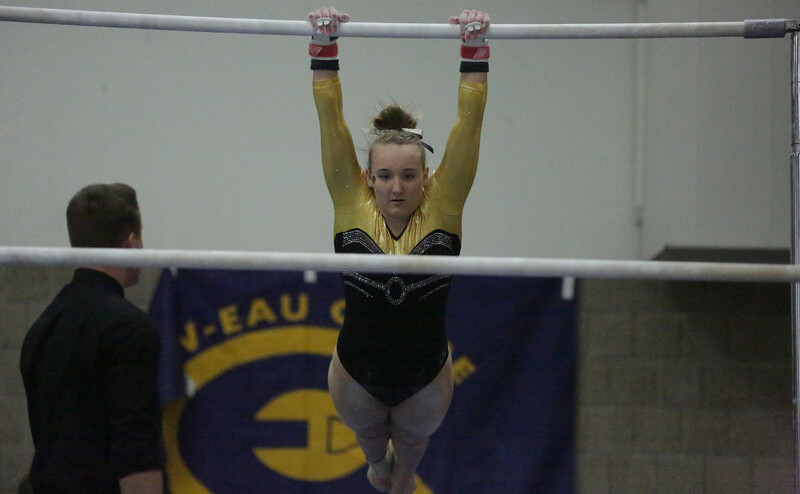 The Gusties’ bars score marks a season high. The bars lineup was led by Sam Ardy (Fy., Thousand Oaks, Calif.) with a season-high 9.500, taking first place. Alex Kopp (Jr., Wayzata, Minn.) followed in second with a 9.425, a career-high. Emily Anderson (So., Mendota Heights, Minn.) and Amanda Malo (Fy., Greenwood, Minn.) scored season-highs of 9.075 and 9.025, respectively. The vault was paced by Kopp, taking second place with a 9.425, while Malo took third at 9.350. Floor was also led by Kopp at 9.600, taking first place. Malo and Jaimie Niedermayer (Jr., New Prauge, Minn.) were next in line for the Gusties with scores of 9.275 and 9.225, respectively. The Gusties top three on the beam placed third through fifth. Malo scored 9.450, Kopp tallied a 9.350, and Rachel Thiner (Sr., Sioux Falls, S.D.) posted a 9.300. Kopp had another career night as she posted a personal best 37.800 in the all-around, which is tied for the fourth highest all-around score in program history. Malo was close behind with a season-high 37.100 as the only other all-around gymnast. “Individually, Alex and Amanda had career nights in the all-around,” Bell said. “That was great to see Amanda over the 37 mark. Emily Anderson had another great meet. She’s consistently one of our top performers and her hard work is certainly paying off. Sam had a huge bar routine to capture another event title. Gustavus returns to the gym next Saturday at the Best of Minnesota Invite, hosted by the University of Minnesota. Congratulations Gustie Gymnasts. It sure has been fun watching all of you having a lot of success this year. Congratulations Rachel and Rachel on your careers. Good luck next weekend.